Magazine and newspaper publishers can win with the iPad, because it is the first digital platform that turns print-style substance into a strength, instead of the weakness that it has been since the inception of the web. As everyone knows excruciatingly well, print publishers blew Digital 1.0, because they thought they could get away with simply shoveling the usual words, pictures and ads onto the web or, later, scrunching them into often-clumsy iPhone apps. They can’t afford to make the same mistake with tablets or they will be toast. This is the latest in a series of Newsosaur posts providing publishers with actionable revenue and content strategies for the tablet platform. The entire collection of articles, which has been packaged in a convenient 10-page PDF, is available here for immediate download at the nominal charge of $1.99 (the cost of a single app). Fortunately, print publishers have a distinct edge over their digitally indigenous competitors in the race for tablet supremacy, because they have a depth of content that will work to great advantage on tablets. If magazine and newspaper publishers execute smartly, their unparalleled advantage will make them hard to beat. Because Tablet Land is virgin territory, traditional print publishers have a near-equal chance of crafting winning products for readers and advertisers alike. And, to be clear, any successful products must satisfy both. The strength of print – as illustrated in Figure 1 below – is that it enables deep and subtle exploration of a subject. When pictures, audio or video of a compelling or emotional event are not available, words can recreate the drama. Print gives journalists room to spread out and tell a story, making it by far the most substantive of media. It also represents a comparatively quiet, personal activity, where the user typically is forced to concentrate on one article at a time to derive full benefit from the experience. The strength of print also is its weakness when it comes to online publishing (Figure 2), which demands shorter, more graphic content. While it is a luxury to be able to read a long, well-written article in print, it is a pain to read the very same thing on the web. The web works best as a graphic medium, enabling the quick consumption of bite-sized bits of information, preferably conveyed in pictures or videos instead of long, gray blocks of text. 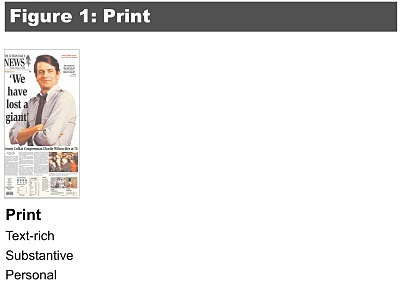 Print, by definition is a static, lean-back medium. 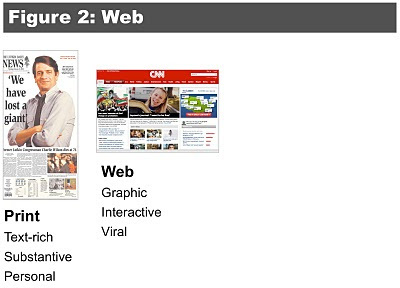 You can choose a publication and flip through it, but the experience is limited to the four corners of the page. 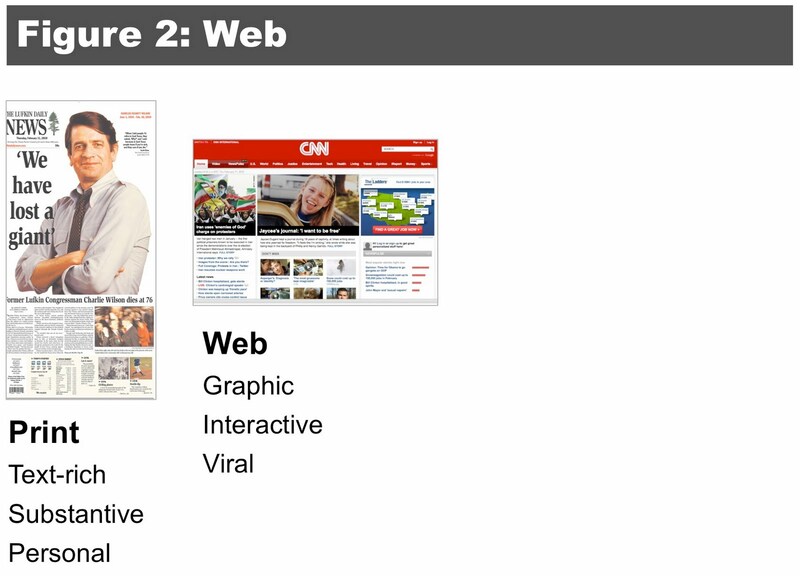 The web, in the other hand, is a lean-forward medium that lets consumers infinitely customize their reading experience. Because the web is interactive, users can comment on what they see, buy something they like and even create their own content. Far from being a platform for passively acquiring information, the web has become a form of self-expression and an active social medium. Natives of the print world, who are experts at telling people what they think but not always great at listening well, have a difficult time understanding that the digital media are all about audience participation. The best digital media – Facebook, Aardvark, Yelp and many others – don’t merely engage readers but also encourage them to invite their friends. The viral nature of Facebook is why the number of visits to the addictive site recently surpassed the number of visits to Google. 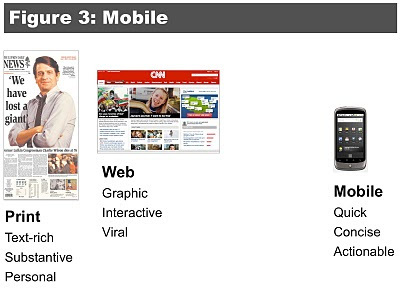 The easiest way to think about mobile media (Figure 3) is to imagine the web on speed. Screens are smaller, so information has to be presented more concisely and, ideally, more graphically than on the screen of a laptop or PC. Connections generally are not as fast or reliable as on wired computers, so downloads have to be quick. These factors make it all but unbearable to read long articles on a mobile device, leaving you to wonder why even some of the most sophisticated print publishers think it’s OK to dump full-length articles into the mobile apps they give away for free. The mobile media, of course, have the advantage of being pocket-sized and portable. Further, the GPS capabilities of the growing number of smart phones makes it possible to locate the position of the user within a matter of feet. This powerful capability means that individuals don’t have to do anything other than switch on their phones to get targeted and actionable information from publishers and advertisers. Services like Loopt and Urban Spoon get this concept in spades. Both the web and mobile platforms readily enable such transactions as finding plumbers, rating restaurants, communicating with friends, getting directions, comparing camera prices, buying theater tickets and so much more. While transactions may be a major component of the web experience, they are the essence of the mobile experience, which is all about getting things done. Here. Now. Fast. As illustrated in Figure 4, the tablet combines the strengths of print, web and mobile into a satisfying – and, yes, transformational – experience. The device is large enough, light enough and comfortable enough to hold for such lean-back activities as reading a book or a magazine article. The wireless connectivity of the iPad and most of its imitators makes it possible to take active – or should I say interactive? – command of the media experience by clicking to new sources, downloading updated information and consuming audio and video presentations. Connectivity also means that the devices are fully equipped to perform all manner of transactions, a capability near and dear to most advertisers. The tablet represents a fresh opportunity for traditional publishers, because it is the first digital platform that turns hard-to-match, print-style substance into a strength, instead of the weakness it has been for most web and mobile applications. 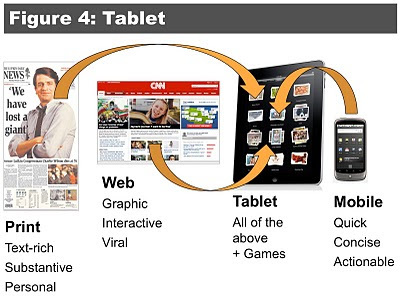 But book, magazine and newspaper publishers cannot win by simply lobbing their traditional fare onto an iPad. Unfortunately, the new $16-a-month app from the Wall Street Journal does little more than that. As demonstrated toward the end of the video below from my friend Chris Hobbs, the ad for a credit card company demonstrates a lot more creativity and interactivity than anything produced by the newspaper itself. Publishers who want to take full advantage of the iPad will have to do better by creating content that is media-rich, interactive, viral, transactional and mobile. In other words, this is no time to cut corners. "I love the New York Times. Love it. Read it every day. What's that? Can I express my love in terms of American dollars? That's what I would be willing to spend -- provided I could get their information on my iPad, or iPhone, or laptop, or Kindle -- whichever I choose, the moment I choose it. Just because I can afford an iPad, doesn't mean I'm stupid -- or made of money. I am a consumer (and, obviously) a creator of information; media. I want what I want when I want it where I want it on the device/screen I want it on. Simple, really. It's one of the reasons I love Apple products so much. No one, yet, does a better job than Apple at meeting my basic want. As for the New York Times and their $20 app, which only makes me a bit embarrassed for them, well, petulance should never be a corporate strategy. 1. Information wants to be MONETIZED. This is quite good for blogs, search engines, business websites, creators of information, manipulators and aggregators of information, etc. 2. Your cost structure is of zero consequence to anyone. This is the sucky bit for newspapers. If the NY Times needs $20/month from me to survive, then they will not survive. Because they can't untether themselves from their pre-Internet cost structure newspapers will go extinct. I do not care that they need, say $28/month to keep the newspaper going and that the newspaper is where they earn all their revenues. Not relevant to me. Can you tell me how you came up with the 5.75§/month figure ? I like alot of the points about Tablets, in general, but it is crazy to ignore that the iPad is but 1 product in a new and growing category. Sure, the iPad may become the dominant format at first, but much as Android's OS is now catching up to iPhone OS on marketshare for smartphone devices, the many e-readers and other tablets will also be important places for publishers to play in this space. a) work on your websites, which is now accessible to all tablets in a nice large screen. Same as your desktop users already see it. b) build apps for each tablet's dominant device platforms so you do not cut anyone out. c) Both and create synergy together. I just do not understand why Alan would put such intense focus on pushing media and news firms to go out and build apps for a device platform that has a nice size screen and web browser! Tablets and laptops are unlike smaller mobile devices that required software applications (apps) to be built just to re-format our content for the small device screen. the most popular apps on these small mobile devices are real software programs, games, not re-formatted content from big websites. Does anyone make software applications for desktop computers to read and visit media sites? Can someone tell me why a tablet user deserves a custom software app? I think Brian Hall is dead on. Not sure where he came up with $5.75 but I do agree that people aren't going to pony up $15 or more a month for a newspaper on the iPad. Maybe the WSJ they might because it's a business write-off. Now, all that said, I have to add that I'm surprised - well, sort of - that the WSJ iPad product looks so much like a newspaper. It's just the first iteration so maybe they'll think outside the newspaper box next go-round but I hope publishers don't think they can just "repurpose" their print content without redesigning it to take better advantage of the medium. Take that HTML5 video ad, for example. Why not turn it into an app itself by letting the user tap on the image and then take the car for a "test drive" using the iPad as the steering wheel, racing through the Alps on windy roads and then sharing their high scores with other app users or on Facebook or other social media. And the carmaker could select the high score as the winner of a new car at the end of the ad campaign? Now, THAT would be freakin cool. All, I subscribe to the theory that if I like it, someone else does, too. If I pay $5.75 that's probably somewhat in the ballpark. My original comment I think was clear that the $5.75 figure was *mine* and not a survey of iPad owners. (I am an iPad owner and a NY Times reader. The $5.75 is what I would pay. Having not been in the newspaper business but having been in the Internet business for 15 years, I must say I'm fairly confident that very, very few people will pay more than a few dollars (certainly under $10) each month for an online version of the Times. @ marc :" I just do not understand why Alan would put such intense focus on pushing media and news firms to go out and build apps for a device platform that has a nice size screen and web browser!" Hi Brain, I totally agree (I'm in the Internet business too, and have an iPad as well). I was just wondering if your 5.75 was the result of a specific numbers crunch. I’ve been following your blog a bit and, while finding it insightful, I still feel inclined to challenge you to break free of the “technology will be our savior” mindset. As with books, newspapers are a mature product. Except for improvements in printing equipment and the telephone/telegraph, it’s hard to make a case that any gains in communications technology have made any fundamental impact on the industry. Newspaper publishers are, as Disraeli said a century and a half ago, “in the business of buying paper for a pence and selling it for six pence.” If today’s publishers would like to remain in the news business, they would be better served to remember this. They should stop wasting time and resources on chasing the “next big thing” and unrealistic profit margins, and instead focus on what provides the greatest benefit. Drawing on the example of community newspapers and European newspapers, metropolitan newspapers should simplify their business model, focusing on a vast increase in local news content, and greater attention to attracting local advertisers. News should stay on paper, where it can be conveniently and profitably sold along with advertising sufficient to cover the fixed costs of providing the news. The more news and the more ads, the more readers they will find willing to pay for the privilege of reading the paper. Web sites are not a replacement. At best they are an expensive distraction. At worst, they are a menace. The Internet is a journalistic poor house, with an increasingly fractured revenue stream favoring web sites attentive to massive indexing and sensation over substance. News on the ‘net can never be more than an underfunded afterthought. Rather than giving people a reason not to subscribe to the printed product, newspaper companies should keep their websites as a place for taking subscriptions, reserving advertising space and requesting archival material. Publishers should also make their news product, with sufficient delay to preserve local competitive advantage, available for resale to web providers. A secondary market is sheer profit…which would be a nice change from the dead loss the web now offers. This is a business model that will work. Get ‘em to try it, and who knows, they may still be in business long enough to fall in love with the next next big thing…whatever that turns out to be. Anyway, that’s my ramblings on the topic.